First the "TL:DR" executive summary: Get Debian Jessie to install to VMWare Workstation 9.0 to have Gnome 3 run in full graphics mode and not gnome-fallback mode. Go into VM Settings. Make sure that the CD/DVD virtual Device is connected to the Debian Jessie ISO file. I got a window asking Configuring GDM3 - Default display manager: GDM3, just because I could. 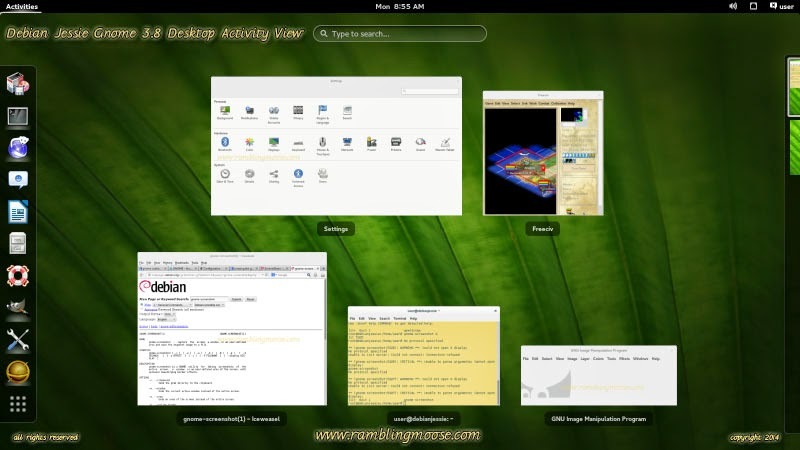 This enables Gnome 3.0 as your default display manager where lightdm is xfce. Since you specifically wanted a clean gnome 3.0, this is how to enable it. It will run dpkg and install a lot of stuff. Second Boot: Logged in, and ticked the session for gnome, gnome 3.0 is active without fallback. Under Jessie, the kernel headers for Linux did not seem to be installed. To install the kernel headers apt-get install linux-headers-3.2.0-4-amd64 or install the latest linux-headers from synaptic. At this point, click on the gnome menu and eject the Debian Jessie ISO. My VM had problems seeing the vmware tools. Having clicked on help, I typed mount /dev/cdrom /mnt/cdrom in terminal and got an error, then magically the iso automounted. I. Just. Don't. Know. Linux magic. Trust me on this one, I was frustrated waiting for it to decide to find the blasted VMWare Tools ISO myself. Extract the files with full path to somewhere useful like your home directory. In root terminal, run vmware-config-tools.pl from the directory you just created and take the defaults. The VM will hunt all printers available to the host machine and tell you that Printer Added a number of times. At this point you should be up and running with Gnome 3.0 in Full Graphics Mode. You can manually tell Gnome to flip back and forth between Full Graphics and Fallback with a command shown at this link. You will now have the ability to arbitrarily resize the windows. You will probably need to go into dconf to configure the way your linux works. There are a lot of tweaks you can do in there. Personally I prefer xfce for its speed and lack of clutter, but that's just me. Now the admittedly long Narrative. This weekend's task was a rescue. I have a very good friend in another city who helps me out with some technology problems, and I help where I am able. He's a VMWare Guru Wizard. My level of knowledge of VMWare is much more modest. I can get things working eventually, and since it is a robust product, that does not take much effort on my part. I could probably be a VMWare Admin as long as there was a guru on staff. He's learning Linux. My knowledge of Linux is more of an intermediate to expert level, depending on what specific end of the software you are looking at. I have (paid) experience with Web Development on LAMP as well as mid level support desk experience with Linux. LAMP is Linux, Apache Web Server, MySQL for Databases, and PHP for programming and scripting. All this stuff is free to install in Linux, you could do it in an afternoon on your old Windows XP computer that should be gathering dust in the closet. It runs on older slower hardware to the point where I had a Debian LAMP install on a Pentium 3 laptop that I just got rid of in 2011 because it simply wore out. Linux people all have their favorite distributions, Debian Linux is mine. It Just Works. It just works on old hardware. It just works on new hardware as long as the drivers are there for the hardware. It is "mission critical" industrial strength. I have given laptops to neighbors who have very little knowledge of Linux or computers in general with Debian Linux installed and they took to it as fast as you did when you got your first Windows computer - or faster! I would be running Debian Linux as my main computer operating system if I didn't have to use Microsoft Office and other Microsoft products to maintain my knowledge in everyday, mainline, run of the mill Microsoft environment Business Intelligence Project Management. But you do have to learn a different way of working, and it does not hold your hands - you could kill a stable system by typing in the wrong flag in an install script and I have. Ok, all that background aside, here's the back story of this specific problem. My friend had decided to attack Debian Linux, which was mostly my doing. He got it running on his Raspberry Pi and was reasonably happy with it despite it being raw and not completely user friendly. I kept hammering the point that it works well on a regular computer normally. That is, if you have hardware that accepts the drivers you need - no weird hardware that there are no drivers for. So since VMWare emulates an older hardware chipset, it *should* just work. It did until he tried Gnome 3. Gnome 3 ran but came in Fallback Mode. You know you are in Fallback mode because you get an ugly black box at the top right of your screen yelling at you that your drivers did not work because you don't have 3D Acceleration drivers enabled. This is a known bug within Debian and VMWare communities and this wall of text is how I solved it for myself. With Windows, you surf your video card's website, download the latest drivers, and you're running. Not that simple with a VMWare install of Debian in this specific case. Debian is built with a number of theories or ethos. Debian Theory One: It intends to be free of proprietary software - licenses are not allowed other than the GPL. You can recompile Debian to fit your needs if you have the knowledge. You can sell a computer with Debian freely. You can also include proprietary or "non-free" software since it is YOUR computer. Debian Theory Two: It intends to be rock stable. Never Crash as long as your hardware doesn't "die". If Debian installed, and your hardware matches, you will see actual running uptimes measured in terms of years and not days. My Windows 7 computers never really go past 3 days without having Firefox crash because of memory leaks. I did get to 8 days once and it wasn't pretty. I have had Debian uptimes over 6 MONTHS and I only restarted it because I clicked the wrong button. Debian - it's THAT good. There are other Linux versions or Distributions or Distros that can be as good, but Debian just clicked with me. After going through a day of my friend's annoyance that Fallback Mode kept coming back no matter what he did, I pushed away from the problem and gave it a day. It became my weekend project. The research arc spiraled to one specific program area. People were looking for guides to enable 3D Acceleration in Debian Guests. Some solved it others didn't. Following the instructions meant doing some additions to the base operating system. Following those instructions with a "clean room" install from the directly downloaded "Squeeze" install disks didn't work, I ended up with a broken install where I was staring at a login prompt and a broken graphics window. The Program that needed upgrading ended up being the server for Xwindows itself - xserver-xorg-video-vmware that had been upgraded to the next version in Jessie. Squeeze is the stable version, Jessie is the "next" or Testing version. Testing or Jessie is stable enough for daily use but it is quirky and more cutting edge software. Not quite bleeding edge, but more raw. So I downloaded the newest Jessie install disc and installed it. It came up in Gnome 3 correctly first time. It ran as we intended after installing all that software at the top of this long article. There are some configuration quirks, and I may not pursue all that for my own use since I prefer XFCE which is simple and fast, but Gnome 3.0 is behaving.